For Basic Wind Speed Map (Fig. 6-1) see 'Wind Map' application of this workbook. or surface water) or atmosphere (where appropriate) shall be eligible for classification as a Category II structure. 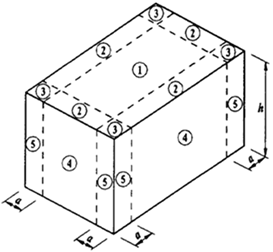 This reduced classification shall not be permitted for seismic loads. releases during and after hurricanes. material or equipment) required for operation of Category IV structures during an emergency. - Water storage facilities and pump structures required to maintain water pressure for fire suppression. Large city centers with at least 50% of the buildings having a height in excess of 70'. Use of this exposure category is limited to those areas for which terrain representative of Exposure "A" prevails in the upwind direction for a distance >= 0.5 miles or 10 times the height of the building or other structure, whichever is greater. Urban and suburban areas, wooded areas, or other terrain with numerous closely spaced obstructions having the size of single-family dwellings or larger. Use of this exposure category is limited to those areas for which terrain representative of Exposure "B" prevails in the upwind direction for a distance >= 1,500' or 10 times the height of the building or other structure, whichever is greater. Open terrain with scattered obstructions having heights generally less than 30'. This category includes flat open country, grasslands and shorelines in hurricane prone regions. Flat, unobstructed areas exposed to wind flowing over open water (excluding shorelines in hurricane prone regions) for a distance of at least 1 mile. Shorelines in Exposure D include inland waterways, the Great Lakes and coastal areas of California, Oregon, Washington and Alaska. This exposure applies only to those buildings exposed to the wind coming from over the water. Exposure "D" extends inland from the shoreline a distance >= 1,500' or 10 times the height of the building or other structure, whichever is greater. This program assumes that a Gable roof is symmetrical, as the ridge line is assumed in the center of the building width, L.
For flat roofs (roof angle = 0 degrees), either Gable (G) or Monoslope (M) may be used. This application assumes either Enclosed or Partially Enclosed buildings, and does not consider open buildings. for open or partially enclosed buildings. 2. An open building is a structure having all walls at least 80% open. % of openings in balance of the building envelope does not exceed 20%. The Tributary Area pertaining to the Main Wind-Force Resisting System (MWFRS). 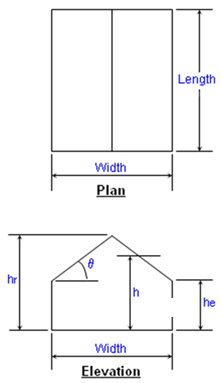 For calculating the sum of the wind load on the windward and leeward walls parallel to the building ridge, the average roof height = (hr+he)/2 is used. Notes: 1. Design wind pressures are net pressures (sum of external and internal pressures). 2. Wall net pressure for MWFRS is total for both windward and leeward walls. 3. (+) and (-) signs signify wind pressures acting toward & away from respective surfaces. MWFRS pressures for roof only. 6. Minimum wind load for MWFRS and C&C shall not be less than 10 psf. 7. References: a. ASCE 7-98, "Minimum Design Loads for Buildings and Other Structures". ???????????? b. "Guide to the Use of the Wind Load Provisions of ASCE 7-98"
?????????????????????? by: Kishor C. Mehta and Dale C. Perry (2002).